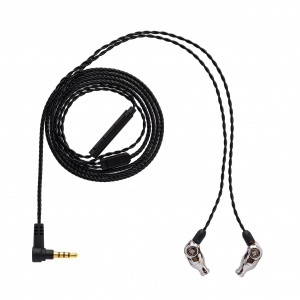 Copper Litz Cable with 3-Button Control + Mic. Designed and Assembled in Portland, Oregon. The Comet simply sounds good. Really good. It has a nicely balanced low-mid fullness with the high frequency extension magic from our 3D printed Tuned Acoustic Expansion Chamber sprinkled on top. 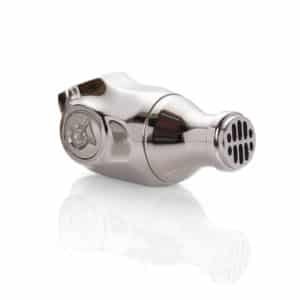 The weight of the new stainless steel body feels great in the hand and the low profile designed keeps it comfortable in your ear. An excellent seal lets you block out the world and escape into your music. The Comet simply sounds good. Really good. It has a nicely balanced low-mid fullness with the high frequency extension magic from our 3D modeled Tuned Acoustic Expansion Chamber sprinkled on top. 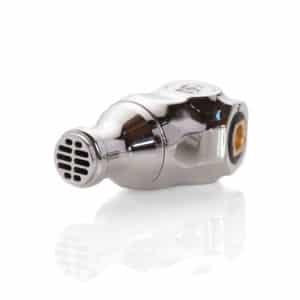 The weight of new stainless steel body feels great in the hand and the low profile design keeps it comfortable in your ear. An excellent seal lets you block out the world and escape into your music. Comet is designed and assembled in our Portland, Oregon workshop. Our new stainless steel earphone bodies are drop forged and then CNC machined before being hand polished to a mirror finish. 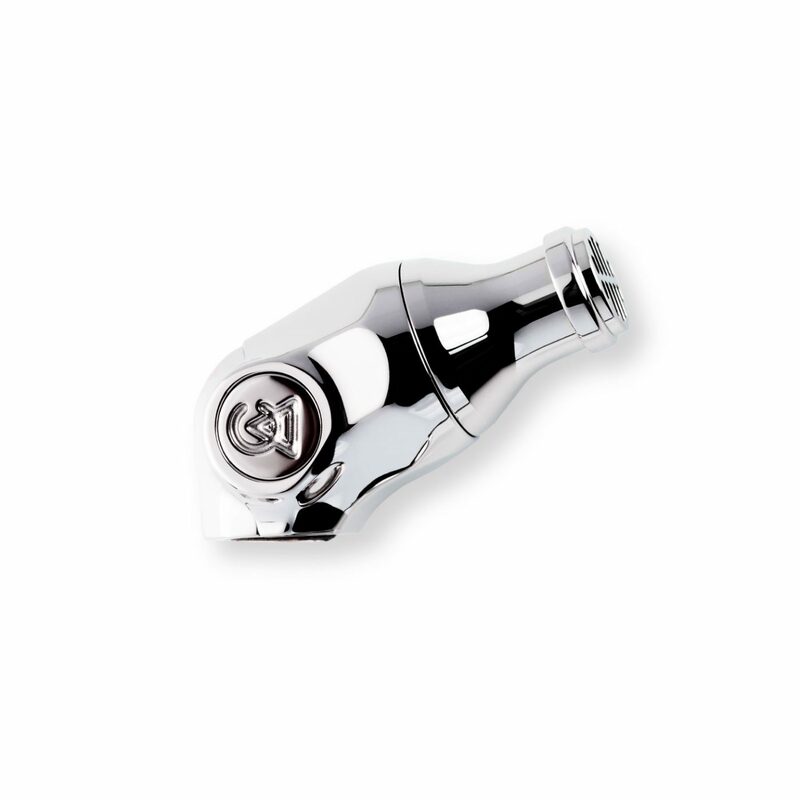 The durability of stainless steel provides peace of mind in daily use. Each earphone is assembled by hand in our workshop by our team of highly skilled craftspeople. Comet utilizes a custom design vented full range balanced armature. It delivers a sound that can deliver crisp snares as well as the thump of the kick drum. Adding the vent gives us that punch. Adding our T.A.E.C. takes off the ceiling and lets the highs breathe at the top end of the sound. Comet utilizes a custom design vented full range balanced armature. It delivers a sound that can deliver crisp snare drums as well as the thump of the kick. Taking the tangle-resistant cable design from Polaris, we’ve added a new 3-Button control + mic system for mobile use. This cable sounds good and has a new level of functionality for the critical listener on the go. 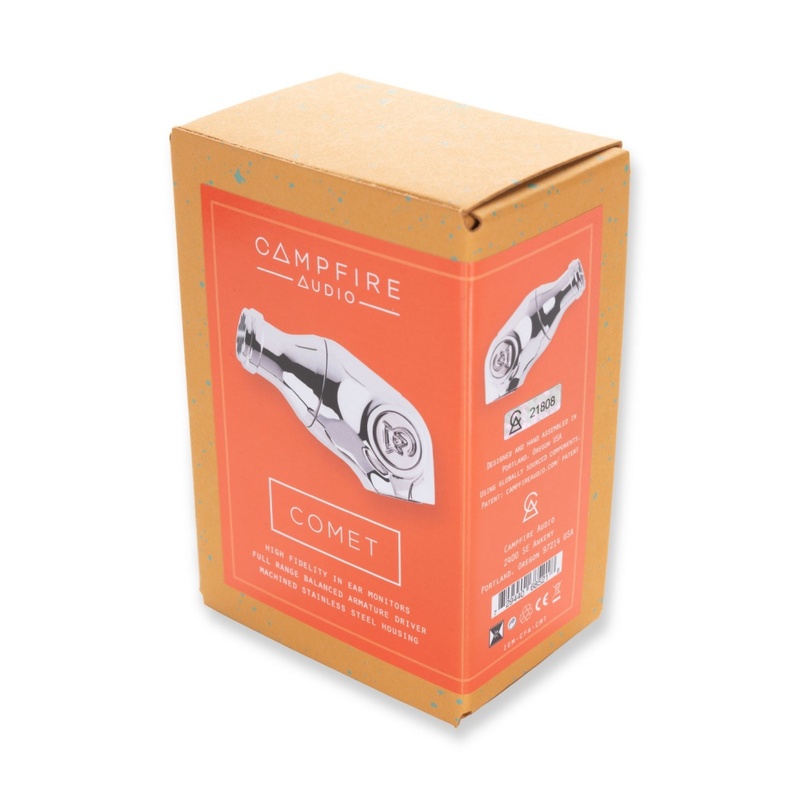 The Campfire Audio Comet pair produces a balanced sound across all frequencies, with only a slight bump in the high frequencies that adds detail to the consonants on vocals. The Comet earbuds are beautifully designed with a stainless steel body and come with a replaceable cable that features a three-button remote/mic. 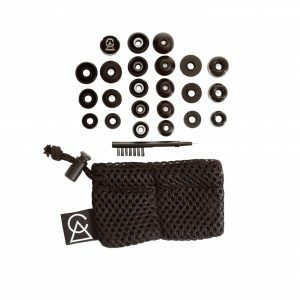 Campfire Audio has done a fantastic job of bringing to the market a new product that is rife with the style, technology, and quality they are known for, all while avoiding cutting corners to keep costs down. This is not an earphone you need to approach with caution and is something you can purchase with confidence. For $200, you won’t get a better deal. Deep and tight bass, lush, clear mids, and no compromise in the highs. Balance balance balance. Great transient response and sufficiently detailed. It may not have that oomfy, concrete feel of the higher priced models, but…Pretty, pretty, pretty good. The Campfire Audio Comets are using a single wideband Balanced Armature driver and deliver a stunning sense of realism. Drop forged and then CNC machined before being hand polished to a mirror finish. This is something to see for yourself. Our custom Beryllium Copper MMCX eliminates the traditional shortcomings of the connection and harnesses all of its benefits. Beryllium Copper provides a robust mating mechanism; one that is typcially made from soft brass. This selection of a harder material extends the life of the component and the earphone. Each unit is assembled by hand in our workshop by our small team of highly skilled craftspeople. From driver to body each component part is carefully examined and tested. After each unit is built, it is placed into a pairing pool, where it finds its ideal sonic match. Campfire Audio Copper Litz Cable – Copper Conductors with Berylium Copper MMCX and 3.5mm Stereo Plug. Features inline 3-button control with Mic. For the past few years, the good folks at CA have made it a practice of offering astoundingly high quality IEM’s. Their products don’t necessarily hover in the lower price bracket of this market, but there is no mistaking that with CA products you get what you pay for; industry leading quality and design, and most importantly, top shelf sound. Regardless of the model, and I have three of their IEM’s, nothing is left on the table when they offer a new product. So, when the CA team introduced an entry level single BA IEM with the technology of their higher end models, a striking (and totally unique) design, and the now standard CA world class cable I was in from the start. The Comet arrives with the standard and excellent CA packaging, case, and accessories. As with the IEM’s contained therein, attention to every detail of the package and accessories stands out. If you are reading this review you have seen the photos and know that the design and execution of the Comet are extraordinary. How do they sound, you ask? As amazing as they look, I say. Days after receiving the Comet, I had a round trip to Denver. With the CA brand foam tips that were installed on the Comets, the isolation was excellent, and the comfort superb. I wore them for 3+ hours with no fatigue or soreness in my ears. 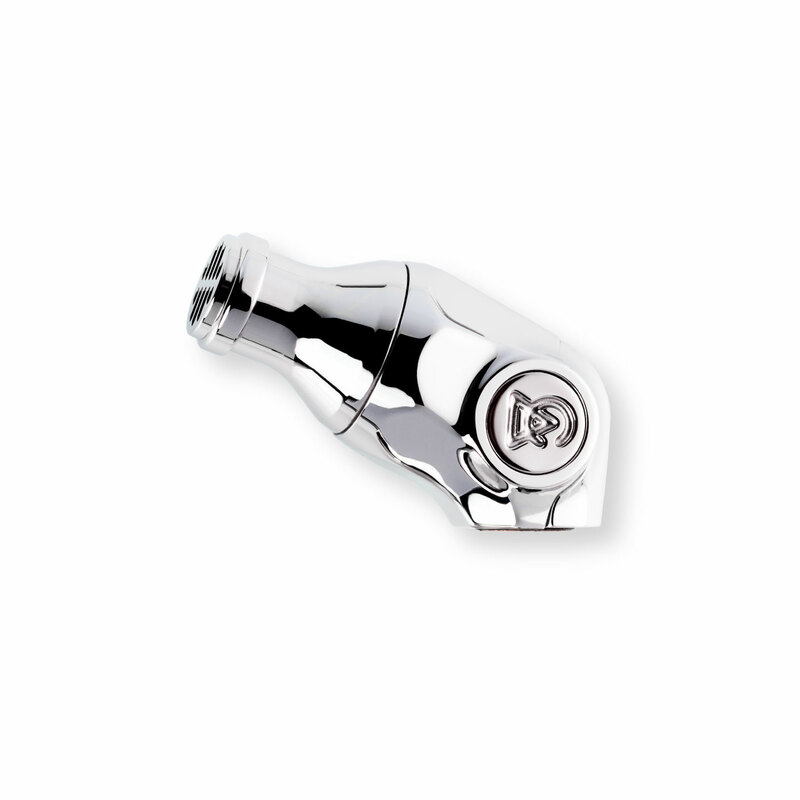 The design and size of the Comet allows them to be inserted well into the ear canal. I found the isolation to be easily as good as with my CA Nova, and perhaps a bit better as the Comet design allows for deeper placement. The sound signature / tuning of the Comet is in my opinion close to perfect. Not sure that these would be ideal for lovers of thumping bass, but the bass presentation of the Comet is clear and quick, and for me, just right. The mids (vocals) and highs are also presented with outstanding clarity. Again, just right. I hear an even handed presentation where no single part of the sound spectrum is emphasized, but then, no part is missing, either. The recordings I have listened to with the Comet just sound the way I think they should sound. The best way for me to describe the sound of the Comet is natural, and engaging. The sounds of the instruments and voices are not congested, but distinct, and well placed. In general, I don’t usually have high expectations for sound stage with IEM’s as there seems to me to be a physical limitation when you are essentially placing speakers within millimeters of your ear drums. As a result I am probably not the best judge of this attribute, but it would be hard for me to believe that the Comet falls short in this area given the overall high level of the sound quality that these put out. Listen to the opening bars of “Magic Bus,” (studio version) one of my go to tracks for judging sound stage / instrument placement. The Comet has it covered in spades. Do I recommend the Comet? Youbetcha. I’ve been into hifi audio for about a year and a half now and my first iem I got about a year I was using a pair of shure se215 iems for: practicing music on my guitar, listening to music, and sometimes playing some videogames, but mostly for on the go; however the cable began to turn green on the inside, and the treble became painful to me and changing the cable only reduced the harsh sounding mids and treble just a bit. So I started to look around for a new pair of iems and when I hear the campfire had a more affordable iem I went a head and bought it as I’ve always hear really good things about their iems and they are made in America. And compared to the 215s they have less ear piercing treble, my full and emotional intimate sound with good sound stage and Imaging with more detail the my sennhiser 598s or my shure 215. The sound signature of the comets is a reduced be still present and full bass compared to most other single ba iems I’ve heard with a very fast smooth mid range, and very clear and detailed highs that doesn’t ever become ear piercing to me and can do anything for jazz to screamo heavy metal perfectly fine. The build is also spectacular and they fit very well, but they are heavy iems, and the cable is alwsome and I have had no problems with it. Over all I find they to be great, how ever if you want alot of bass: rap, dubstep or trap I would suggest look at other iems, but if you want smooth mids and highs: rock, jazz, classical, instrumental, pop his is the iem that I recommend. These are very good earphones. This is my first pair of IEMs but I am really enjoying the sound quality for the money. I have Aeon Closed Backed Headphones from Mr. Speakers and have had Sennheiser HD650’s and these fit right in as thesr earphones have an ever so lightly lean towards warm, while retaining the ability to present detail even on the higher frequencies. I really love these earphones and would highly recommend them. Great selection of tips for all ears included with a nicely finished carrying case. First time buying IEMs, though I borrowed my friend’s FIIO F9 Pros and got hooked. My daily drivers are a set of cheap $25 Xiaomi ZBW4326TY, a Philips 9500 at home with a Moda mic, and a garbage Jabra headset with mic at work. I’ll pair these with a Hiby R3 on the road, and at home I use a Soundblaster X7. The soundblaster is great for me because I can plug in a mic and headphones in the same box (I skype a lot with business folks around the globe). I binged on audiophile videos and decided to buy the Comet. I don’t yet know how to review a headphone, so forgive me for not using familiar vernacular. I listen to bands like Chvrchs, Screaming Females, Ghost, Lana Del Ray, Yeah Yeah Yeahs, LCD Soundsystem, Gojira, Burzum, Giraffe, Giraffe, Diplo, and some NPR-like podcasts. I hear a lot more detail across all genres – sometimes I feel I’m listening to an entirely different band (ok, this is an obvious experience for n00bs, but some bands really do sound like they’ve been remixed and the experience is super cool). A couple things that stand out – they’re not bass heavy like Beats and blow away Apple buds. Bass is there for sure, but it doesn’t linger around or make things muddy. It’s clear to me now how crappy bass heavy headphones sound – bass heavy sets cover up a lot of music in the middle and cover up vocals, and I seriously cannot wait to wear these and experience more of my go to songs. People’s voices (singing, talking) are more upfront and I can hear much more detail and clarity. I also feel like music is in front of me or is more like surround sound in a dolby movie theater – I dunno guys, I just know it’s super neato. Nothing seems to be harsh or sharp, like the treble from highhats in metal, hard rock, and some EDM doesn’t pierce my ears, but I can certainly hear treble more clearly. There’s just a lot of detail and layers, with out things cover over other things (jeez, writing this audio stuff is hard work, eh?). OK, fit. They fit way smaller than I expected, especially looking at the pics – they don’t stick out from my ears and this big surprise. I thought they’d stick way out like some sort of cyborb. They’re not heavy either, and I don’t feel like they’ll pull out easy. I use foam tips and get an excellent seal and these block out other sounds (I wore them in the car the other day and used these Comets. 30 mintues of driving and I didn’t realize I had my car stereo on until I parked and took them out of my ears – wild experience). The cord. Calls are great, people can hear me better than before and I can hear them MUCH better too. But, when I rub against the cord (mostly high up near my head) it makes some bumping sounds in the headphone. I don’t like it and am looking to replace it with a cord that won’t make noise when bumped (more obscure research, yay!). I recommend these to folks like me moving up to audiophile world. I cannot say with authority if audiophiles will like the Comets. I can say that pro reviews and videos out there really like these and are comparing them to $1000 headphones, which I cannot imagine ever owning something in that range. Bought this IEM hoping for something comfortable and well built with a slightly warm but well balanced sound. Not disappointed. This pushes my hifiman re-600, my previous favorite, out of the top spot. The clarity is outstanding. Wonderful imaging, and an engaging, lively sound. Vocals come through beautifully, bass is deep and impactful, and treble is resolving and present without sounding harsh. One caveat I’ve learned, although it’s not a big deal for me. They lose something at high volumes, particularly for songs with a lot of deep bass. Not really different from any headphone, its best to listen at moderate volume and the isolation on these is so good that you really don’t need to crank them way up. Overall, I’m stoked. New favorite IEM and daily companion. I am not really an IEM guy, but I use Beats X and Skullcandy cheapos for the gym. I was chatting with some forum types about wanting to try IEMs and a year later here I am. Now the Comet is my first “real” IEM and I was initially having a hard time getting it to work for me, it seems to be very tip reliant for getting the right sound. Also my ears are weird(part of the reason I don’t like IEMs) and start to ache fiercely after a short time with IEMs. The Comets were no exception, but I found with some tip rolling that I was able to get the right fit and by switching to an over the ear style cable they didn’t fall out or lose seal. The above statements are my only problem with these, and the reason for one star off. The sound once properly sealed is the best sound I’ve heard from an IEM, Highs are just right, Mids come through and are not muddied by the lows. Build quality is phenomenal and I really enjoy the heft and feel in hand. The case is a very nice quality touch and really appreciate that detail added (also really like the lapel pin). The cable is also a very nice quality, I’m not one to use the slider so it being below the controls isn’t an issue, but can see where people might not like it. These are insanely good. As a bass head and lover of electro and drum and bass, a single BA makes no sense… or at least shouldn’t for the sort of music I love. But I’d read so many reviews saying these didn’t sound like a single BA (and they fact they look like a work of art!) I just had to give them a try. And I have to say it was money well spent… even with the extra to get them shipped over to the UK! They may not be the gut wrenchingly lowest in ears I’ve got, or the most detailed, or any of the individual sound qualities I usually look for… yet as a ‘complete’ sound they are the earphones I keep coming back to time and time again. I really don’t know what to say in terms of the sound signature other than they sound amazing. I’ve got punchier, much lower sub pounding sets which I should prefer for my sort of music, yet these still win for me. If I had to find some cons it would only be the angle of the cable which takes some real getting used to when you’re used to normal over ears or memory wire cables. But they are so worth the faffing and they look like they will last a lifetime as the stainless casing is a work of art. If you are even considering these (which you must be or you wouldn’t be here), track them down… trust me you wont be dissapointed! I did an absurd amount of research online before coming to the conclusion that I was going to give the comet a try. This is my first IEM and I wanted to make sure I was getting exactly what I wanted. I spoke to someone on the phone and they said it would take a week to ship, but they shipped it the very next day. I had a lot of troubles with my card but they were very patient and worked with me over email and over the phone to figure it out. Definitely has a small business feel which I appreciate. The IEM’s are great. I have never had anything else to compare it to but they blow my beats and Samsung stock headphones out of the water. Very comfortable, very high quality, sound is better than I even expected. Overall a great experience and will buy from them again. Thank you Campfire Audio for being so patient and working with me through all of my BS. Really lovely IEMs. Beautifully made.Beautiful sounding. Outstanding value.Recommend them highly. You don’t want to miss these. I’m going to try to make this short and sweet. The CA Comet is a wonderful IEM. With that said, it is VERY DEPENDENT on getting the PERFECT fit in your ear. As is normal for me, none of the supplied ear tips worked as well as some Comply Ts600s I had on hand. In this case medium, though I usually use large. After determining that I had to really get these deep into my ear, and then twist them around to get a good seal, the magic began to happen. I’m going to use the FiiO FH5 as a comparison. The FH5s are great, at $60 more money. Mine are fitted with a 16 core cable which really improved them. Absolutely outstanding IEMs. The Comet, in comparison, is more dimensional, more balanced and more organic. More musical, less analytical. Exceptional quality and craftsmanship. Comet is a wonderful listening experience and the best all round, travel, at home, anywhere pair I am growing more fond of everyday. Not just a device, but a true collectable. Best $200 dollars, I have spent in portable audio! These things punch way above their price. Very even sounding, with an open and airy sound. Really amazing how they got this sound, from a single BA. The mids are perfect and the highs have just enough sparkle. The bass is there, and is just right. WOW, these are really good and will keep me satisfied for a good while. Thanks to Campfire Audio, for bringing some joy to my life! The Great, The bad, The WTF? So the great – Beautiful sound, everything everyone is saying is true. These sound amazing and they are not even broken in yet. The bad. Not the best on communication and answering questions. And ships FedEx which is always bad. 4 days to get from Portland to Seattle. LoL. It’s a 4 hour drive! The WTF?? So be sure to read the fine print in the owners manual before buying. These are only approved for use with battery powered music players. WTF? $200 and you can’t use them with you audiophile system? No reason why, just that any electrical outlet source player will damage the earbuds. I live in an apt and bought these to use with my stereo system. I guess not. I’ll keep them for my battery operated music player, but not happy to now have to buy another set of earbuds that will work with an audiophile system. I’m only giving one star because the fact that these are only good for battery powered music players SHOULD have been mentioned more prominently in the description, not just in small print on the users manual. Was really disappointed in the sound quality of the Comet Headphones. Excited to purchase with all the great reviews, but not satisfied at all. Distortion at the higher end of the volume is my biggest complaint. Would not purchase again. Excellent pair of earbuds. The spatial aspect to the sound is impressive. I saw the Comet on the very top of the list on WireCutter.com’s “Best Earbuds” list. I gave them a try and now, I don’t think I can ever go back to any other brand. Firstly the shipping was the fastest of any product I have ordered from the USA [to Dublin Ireland] at three days superb turnaround. The packaging is beautiful and the Comet IEM’s come with a very wide selection of accessoried with earbuds to suite all sizes and shapes. The build quality for $200.00 headphones is exceptional and my daughter was highly impressed with the leather carrying case which has a soft wool like interior. I have been using the Comets with a newly purchased Chord Mojo. The combination and sound qualtiy of Tidal recordings is nothing short of exceptional and I am finding it hard to take them off. My normal HIFI listening is Vinyl KEF LS50’s and REGA P6 through a ARCAM amp which is super. The MOJO Apple MacbookPro and Comet is currently begging for my attention and receiving it for the expansive detailed balanced soundscape. While not the widest soundstage the spectrum from base through mids to high’s are all accurately represented. Glenn Gould’s Goldberg Variations which I am intimately familiar with revealed detail I have never heard from digital sources. Its hard to know whether the MOJO or the Comet’s ere the source of the precision. I know wonder what some of Campfire’s more expensive IEM’s are like. For now I am very happy with my digital [mobile with iPhone6] set up. My last headphones were from B&O a pair of A8’s which I had for 15 years. The Comets are a substantial step up and are surprisingly more comfortable. Could not recommend the Comet higher. I rarely write reviews but in this instance this product is worth shouting about…..And I will. 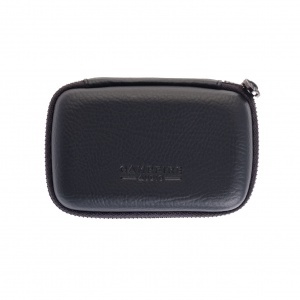 The build quality is exceptional (metal housing/litz cable) The packaging is superb (carrying case/pouch, numerous/generous amount of ear tips included). The SQ is subjective to user’s own impression…these sound ‘balanced’ to my ears. Meaning they don’t impart anything to the music…other than the music…& that’s a very good thing…from my perspective. Uprading from B&O’s (excellent) H3, the Comet certainly justifies the additional cost. Thought I knew Steely Dan’s catalogue on FLAC files inside out. Seems not, the Comets highlighting even more detail buried in the mix. Next Campfire upgrade now being saved for! this headphone is truly great. im not even close to burning them in, and im listening to them over my HD 650 right now. i dont think there are enough superlatives for this IEM. dont hesitate to pick it up. Highly recommend and good value. Have owned numerous in-ear headphones in this price range over the last few years and theses are by far the best sounding. Enjoyable listening from house music to classical compositions. Before I criticise, I must first acknowledge the Comet’s potential. It sounds amazing for its price. Since it only has one driver, base is not too loud. But treble, especially piccolo, sounds fantastic. As for the cons, first of all, the wearing experience is horrific. They fall off regularly regardless of what eartip I use. I have the Andromeda, Beyerdynamic Xelento, and Shure se846, and I must say, the Comet, wears terribly. Second, the impedance is unbelievably high for a pair of earphones. On my SP1000M, a pair of Xelento with 40 volume has the same loudness as the Comet with 70 volume. I understand that it was done for the sound, but 48 is just too high for any phones to drive. If the impedance can be cut down so that regular phones can drive the Comet, I believe Campfire would be able to sell a lot more of these. This earbuds sound great, but are incredibly uncomfortable. I wish they weren’t so heavy in the ears or that there were ear buds with the in ear support. Didn’t realize that earbuds could sound this good. Awesome build quality and accessories. Just beautiful, as well as comfortable.